As I was digesting published literature by the pound in preparation for writing my dissertation, I ran across some pretty compelling information on parenting. Some of it was shocking, like how father absence is on the rise or how negatively children are affected by the lack of a father figure’s presence in their lives. Other information was fascinating because it went against everything I would have expected. One of the most interesting concepts was from a study that observed the way fathers interact with their children nonverbally—specifically, how they physically position their bodies in relation to their children. Now, bear with me here, because, as I observed this in my own life, I realized just how true it really is! There is an intriguing concept called “interactional synchrony,” which is a fancy way of stating that, when a relationship is going well, we tend to mirror one another, but when it is not going well, we tend to avoid mirroring. In other words, if that first date is going well, maybe when you put your hands on the table, she will do the same, but if it isn’t, then she’ll cross her arms instead. Makes sense, right? Salespeople are often trained to do this, because it can actually influence the way an interaction is going, regardless of what is being discussed. We automatically do these things with children, both men and women alike, but as the children grow older, fathers and mothers diverge and take different paths. Mothers continue many of these behaviors well into the child’s lifespan, but fathers tend to drift away from them. That is, unless the mother is around. One study found that, when fathers are alone with their young children, they are less likely to synchronize their behaviors to the children, but as the mother enters the interaction, the father will sync up to both mother AND child! In other words, context is everything, and one of the ways fathers can step up and become more involved is to take more initiative when spending one-on-one time with their children, especially when it comes to being more actively engaged. As parents and children are out in public, mothers tend to place themselves between their children and the rest of the world, leading the way, while the children follow behind like good little ducklings. This nonverbal interaction of body positioning communicates an unspoken encouragement for children to take risks, all while knowing their fathers are present to provide safety and security. Furthermore, this behavior leads children to take initiative in unfamiliar environments, nurturing bravery in the presence of uncertainty, a trait that leads to the development of competition, as well as conflict resolution skills, both of which are imperative to the future development of leadership. If you look at the picture, you’ll notice where my little guy is positioned in relation to his grandpa. 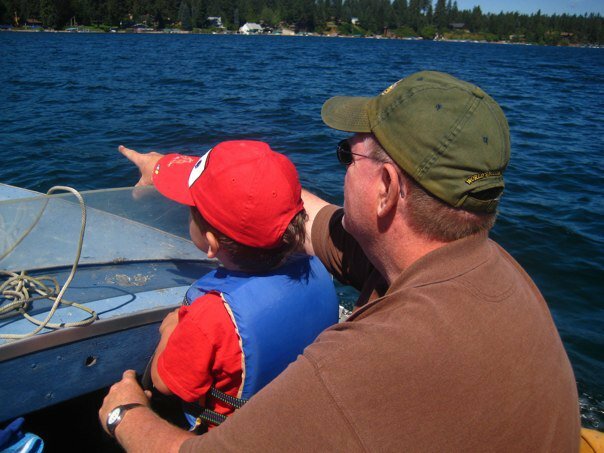 “Papa,” as we call him, is allowing my son to “drive” the boat, to give him a sense of control, as well as initiative. Ultimately, he is empowering my son, all while providing safety and security. To this day, my little boy still remembers this outing with great fondness. Next time you’re out with your kids, pay close attention to how you position yourself naturally. Are you the type to open your child up to the world and allow him or her to explore, or are you the protective type who puts yourself up front? Safely give your children the control and power they need to explore life, and watch their initiative unfold before your very eyes! One thing for single mothers to try, when the father is no longer around, is to vary up the degree to which they walk with their children. If, once in a while, they let their young children lead, then they effectively supplement what has been missing, allowing them to develop initiative. It's a small change that can make a big difference!